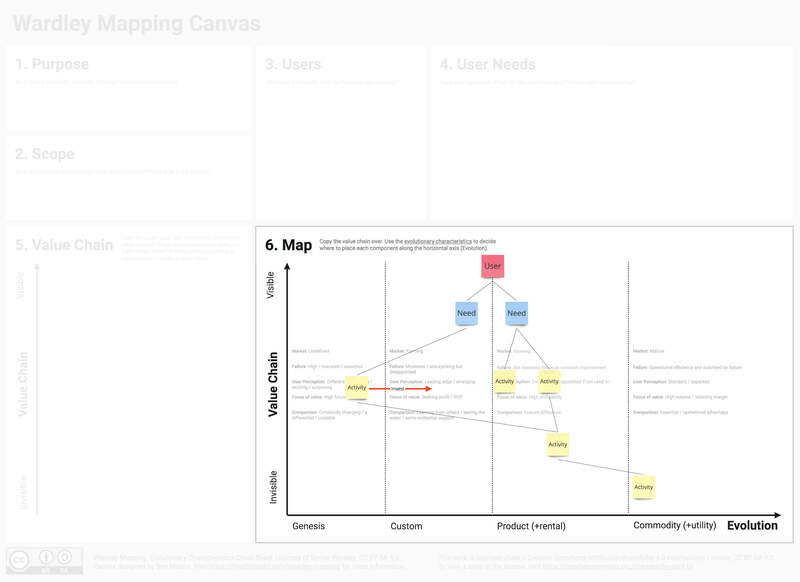 Wardley Maps are all about strategy. To be more precise, they are about building an intuitive and shareable understanding of your context so the strategy you adopt ends up being a good one. All this is especially helpful if you are starting a business or a non-profit, inspecting the competition, analyzing industries for opportunities or even trying to anticipate what the future might hold. To Simon Wardley, the technique’s inventor, strategy can be described using Sun Tzu’s Five Factors: purpose, landscape, climate, doctrine and leadership. In that model, a wise leader has a moral imperative (a what and a why), grasps the terrain (has a map), anticipates the patterns of the forces acting on the environment, trains the organization in universally useful principles and makes shrewd decisions that lead to victory. 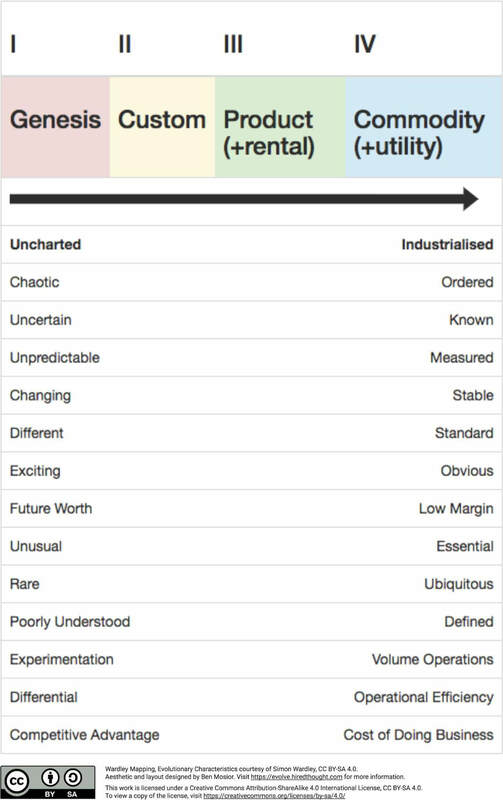 A Wardley Map is a representation of the landscape in which a business operates. It consists of a value chain (activities needed to fulfill user needs) graphed against evolution (how individual activities change over time under supply and demand competition). A Wardley Map represents the shared assumptions being made about a context and hints at what strategic options are available. As a self-proclaimed full-stack freelancer, I find myself working in a variety of wild and different circumstances. I solve business problems, build software prototypes, run workshops and fill in clients’ operational gaps. It is probably no surprise that most of the battles I face are conceptual: How can I make sense of this problem? How can I meet these needs expeditiously? What solution is possible within this budget and timeline? For the most part, I use mapping as a way to quickly validate solutions and avoid costly mistakes – to identify what to build, buy and outsource. A map minimizes the chance that I’ll miss something important, especially in the face of imperfect information. Every step of the mapping process reveals new insights that enable me to make better decisions. The deeper I go, the more I learn and the more likely I am to stumble upon options I would not have otherwise considered. In my view, Wardley Mapping reliably diminishes project risk, and anyone responsible for outcomes of any significance will find it valuable to learn. 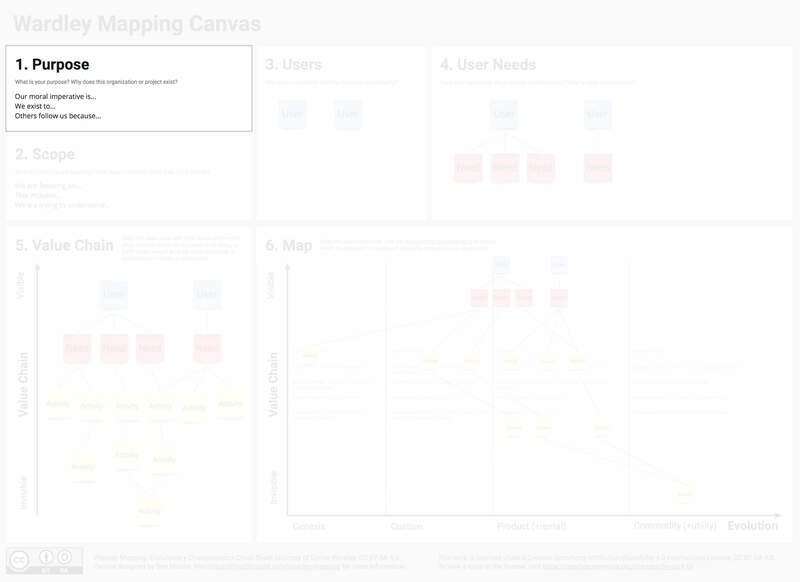 This post will help you build your first map in no time at all using the Wardley Mapping Canvas in Miro. 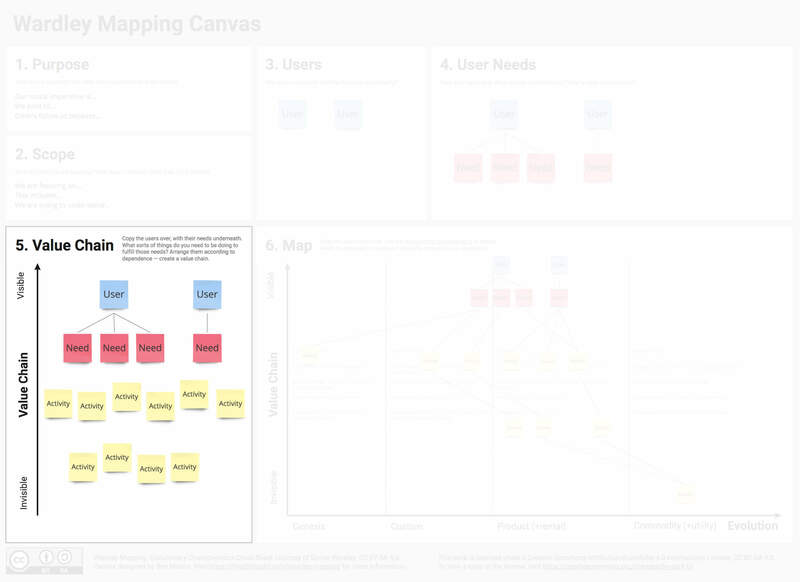 First things first… open up Miro, create a new board and add the Wardley Mapping Canvas from the available templates. For your first map, I want you to spend as little time as possible on each step. 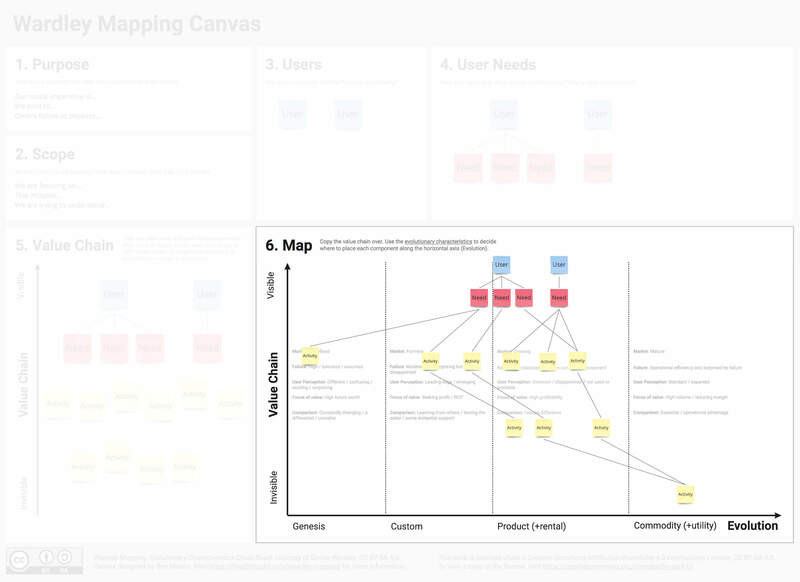 Mapping is an iterative process, and there’s not much to be gained by overanalyzing on the first pass. “Perfect” is the enemy of “good,” and you can always improve your map opportunistically as you discover new information. We’ll begin with the first two panels: Purpose and Scope. As a product person, analyst, executive or anyone else responsible for outcomes, the first thing you need to do is articulate your purpose. What is that deeply felt principle that prompts you to do this work? Consider how you might answer that question both for yourself and for the organization you are serving. What is your moral imperative? Why do others follow you? What is the higher reason for doing this work? Next, describe the scope of the map. Don’t think too hard about it. A reasonable scope can be an individual problem, a product or even a business or industry. Writing out the scope helps you stay focused as you build the map. What significant and important work are you doing right now? What is the thing that must succeed but has a lot of moving parts? What are the problems that needs to be solved? Anything purposefully created has users. A work of art has an audience. A ridesharing service has drivers and passengers. Remembering whom your work serves is important. It can be all too easy to leave critical users out of the picture! Add your users to the panel. Who is expecting something from you or asking for help? Who is missing from the picture? 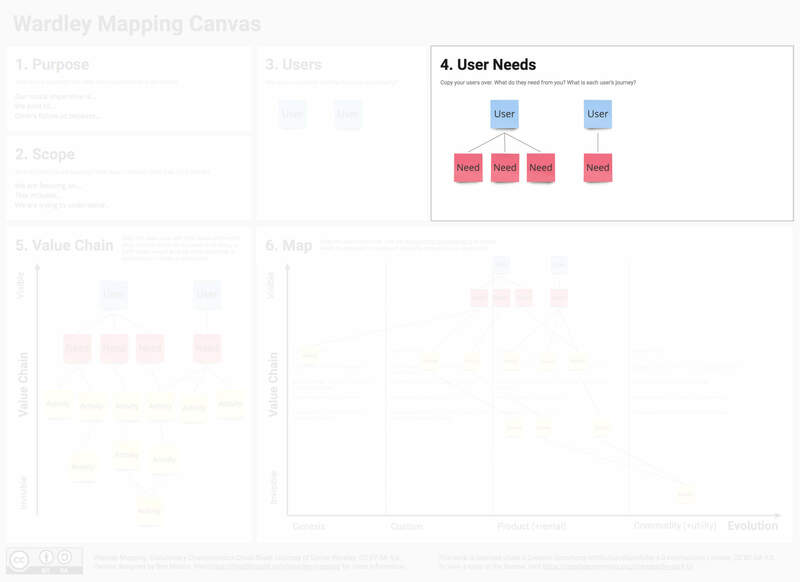 One of the fundamental principles of Wardley Mapping is a focus on user needs. Once you know who your users are, becoming familiar with their needs can guide you toward doing the right work, intuitively. 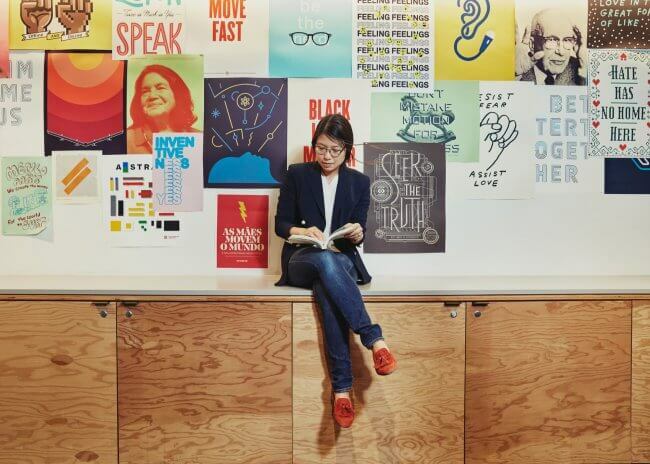 All you need is one guiding question: Is this work aligned with our users’ needs? Copy your users over to the next panel, then add and connect their needs. What’s their first interaction with you? Are there any unmet needs not listed? User needs can’t be met just by becoming aware of them. You need to do real work that directly meets those needs. There is constant pressure to responsibly allocate resources, so you must determine which work is the right work. You can find the answer within the value chain. To create a value chain, copy the user needs over to the next panel and list all the activities that need to happen in order for the user needs to be met. Then list any additional activities that facilitate the activities that you’ve already listed. You should end up with two layers of activities underneath the user needs. Now connect the needs and activities according to their dependencies. What does each need and activity depend on? When any of these dependencies break down, the effect cascades up the chain and prevents the fulfillment of user needs. Identifying these dependencies means that they can be monitored and managed; forgetting them can be disastrous. At the same time, ongoing work that doesn’t fit within a value chain and isn’t meeting user needs is likely wasted effort. Caring for dependencies and avoiding wasted effort go a long way toward diminishing risk. What are all the activities that need to happen in order to meet the user needs? What are the dependencies? Which needs and activities depend on other activities? Is an important dependency missing or unmanaged? How evolved is each component in the value chain? Each dependency in your value chain has evolved through the forces of supply and demand competition. During this evolution, its characteristics have changed as well. In fact, each dependency exists on a spectrum that spans from the new, uncertain and failure-prone to the old, boring and reliable. Why does this matter? Simply put, a more evolved component can be outsourced and treated like a building block, while a less evolved component usually needs to be built from scratch or given other special consideration (money, time and energy). The real danger is in mistreating a more evolved component by building it from scratch. To illustrate the point, consider Thomas Thwaites’s toaster. Outsourcing highly evolved components is a critical aspect of building cost-effective solutions. Since you have limited resources, it makes sense to save them for the components that actually need special treatment. Don’t reinvent someone else’s wheel! Now, copy your value chain over to the next panel. 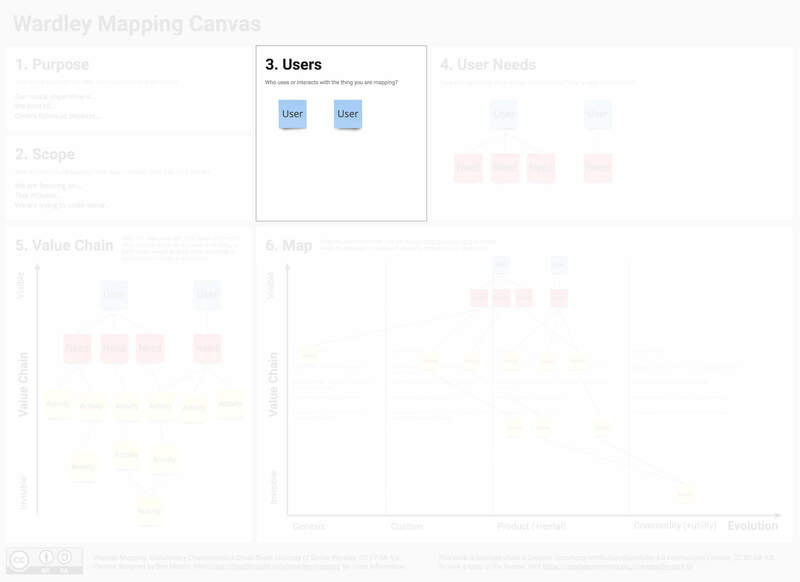 This step in the canvas is basically a categorization problem. For each dependency in the value chain, use the evolutionary characteristics cheat sheet to determine if the component belongs in Genesis, Custom, Product or Commodity. Start by considering just one or two familiar characteristics. For example, you might ask what the market is like for this component. If the market is undefined, then the component is probably in Genesis. A growing market, however, might suggest it’s in Product (+rental). Place each component along the horizontal axis (Evolution) according to your determination. How evolved is each component? How does the rest of the world treat it? Are there any components in Commodity that you haven’t outsourced? Are there any components in Product for which you haven’t purchased an off-the-shelf product? What are you building right now that is like Thomas Thwaites’s toaster? 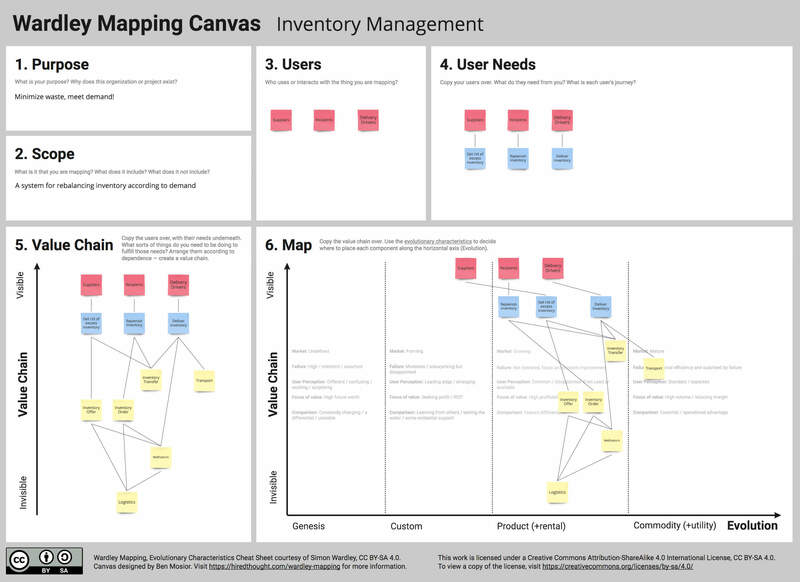 Looking for a tool for Wardley mapping? Behold, you’ve built your first map! 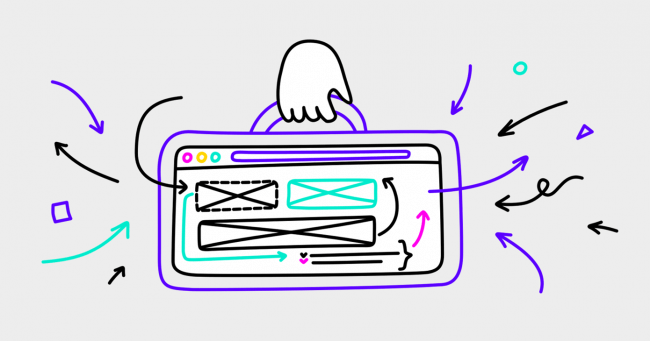 By orienting around your users’ needs and being aware of the dependencies involved and how to treat them, you can now go forth and do your work with purpose. 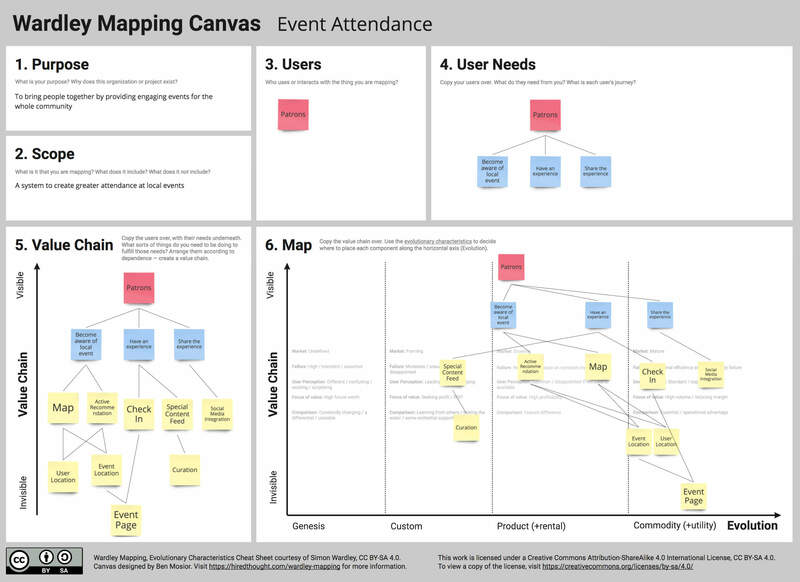 Your next step is to share your map with someone else and discuss what you’ve learned. You can join us on the Map Camp Slack and Wardley Maps Discourse to find other people in the community. 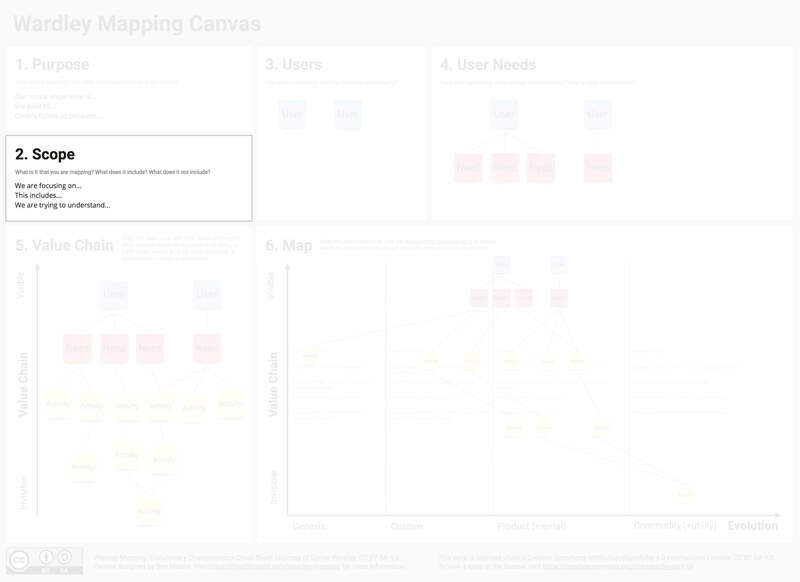 As you gather feedback, you can run through another iteration of the canvas to apply any new information. 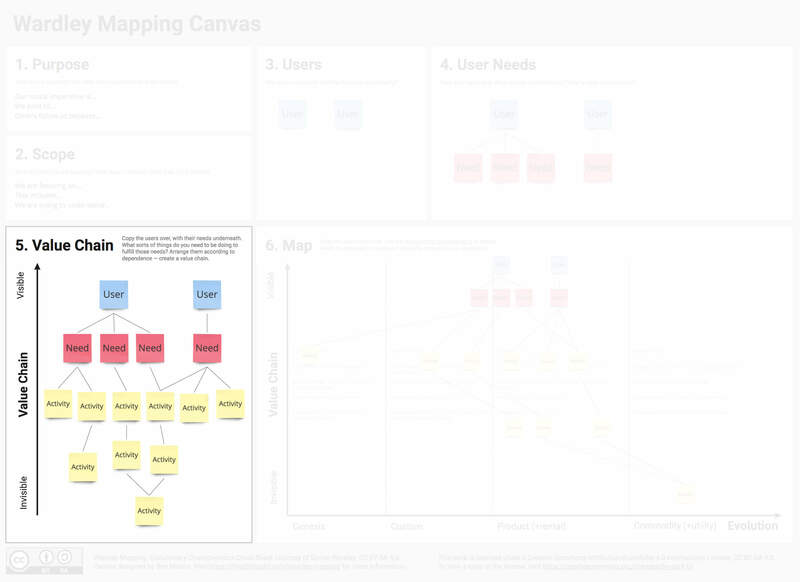 If building your first map helped you learn something about your work, now you can learn even more by diving into Simon Wardley’s book. This post focuses on getting you started with mapping and hints at some ways to use it to diminish risk, but it hasn’t remotely scratched the surface of what’s possible. We haven’t yet explored the implications for methodology, organizational design or, most importantly, strategic gameplay. Know who your users are and center on their needs. Be cautious of work not aligned to meeting those needs! Keep an eye out for missing or unmanaged dependencies in your value chain. Don’t build Thomas Thwaites’s toaster. Outsource components that should be building blocks. Share your maps with others and learn together! Ben is an empathic problem-solver and generalist with a background in tech. He helps entrepreneurs and leaders in purposeful organizations gain renewed situational awareness, break free of inertia and focus on effective execution. 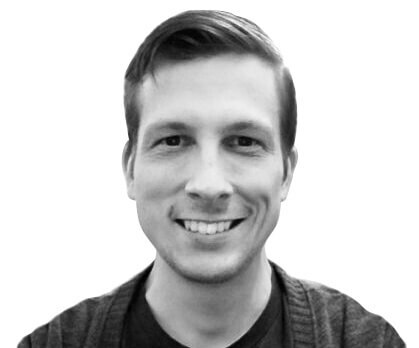 To learn more about Ben’s work, visit hiredthought.com or follow him on Twitter and Medium.